Ten years ago, almost to the date, we six seniors held a meeting with flip chart and textas with the intention of generating a vision of another way of doing retirement and old age. Let’s face it – prospects of living in retirement villages or moving to the country sans old friends are less than appealing. So, today is a very auspicious anniversary because our dream has been realised. Not that we are old yet. Oldish. Still under 70-years. 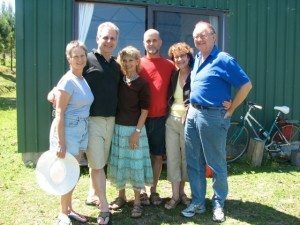 Over a decade, we bought a property, built a house to accommodate three couples, and retired from the city and the jobs we had at the time. And, embarked on new lives. One of us, Heather, wrote a book about our experience called Shedders. She subtitled it How Six Urban Revolutionaries Rewrote the Manual on Retirement. Partly she was fulfilling her dream of being a published author. At the moment we have two Sydney-siders staying with us who are part of a group just starting out inventing their vision of what ‘co-housing’ could look like for them. There are any number of people who have read Heather’s book and been inspired to think about and manifest living communally. It’s not for everyone. But I guess you could say I’m a tribal person and I’m thriving on living this way. However, even the introverts in our group have total freedom to be alone and private when they want. Each of us Shedders is going ahead in different ways (forwardment, if you will) than we did when we were working in the city and raising families. As a long-time yoga practitioner, I find there’s something yogic about what we are doing in this stage of our lives. We are supporting each other in what our individual dharmas are – what we can achieve with our accumulated wisdom and experience. And, there’s more chance of us being successful and satisfied because of the strength of the group. “I believe that the community – in the fullest sense: a place and all its creatures – is the smallest unit of health and that to speak of the health of an isolated individual is a contradiction in terms. Love this article Eve. Inspirational… like “the art of possibility”. I especially like the “model” of getting together with like minded people and having a visioning brainstorm for THRIVING and supporting each other! Such a positive example of personal growth for the whole of life! Thankyou Marlene.